Provost Dan Linzer speaks to students and fellow administrators at Sargent dining hall on Wednesday. 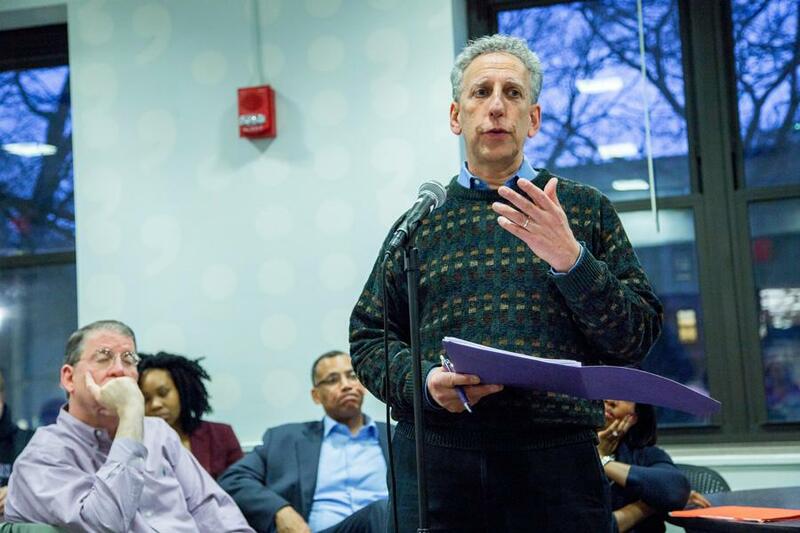 A crowd of 50 that included students and mostly faculty and administrators gathered to discuss Northwestern’s ongoing efforts to make the University’s academic system more inclusive. Administrators and students sat around cafeteria tables in Sargent dining hall Wednesday night, discussing the University’s efforts to make Northwestern’s academic system inclusive for all students as a part of an ongoing dialogue series that resulted from campus activism during the previous two quarters. Provost Dan Linzer began the dialogue with a list of the University’s recent actions on that front, including recent financial aid increases and the search for two Native American faculty members. Roughly 50 people that included students and mostly faculty and administrators attended. Linzer said the greater purpose of the dialogue — more than just to share ideas and information — was to work on rebuilding trust among community members. Both students and administrators repeatedly brought up “cultural competence” in a classroom setting. Ron Braeutigam, associate provost of undergraduate education, spoke about planned changes to the Course and Teacher Evaluation Council system which include adding questions about the cost of courses. Braeutigam said this will work toward creating a more inclusive experience in providing students more opportunities to give feedback. As deans and other administrators highlighted plans to improve “cultural competency” throughout the university, Communication junior Syedah Cabell said professors need to better understand marginalized student experiences to ensure their students are comfortable in the classroom. She asked administrators if there was “anything more immediate that will get faculty to understand the impact of the little things,” recalling her own experience in an uncomfortable classroom environment. Wesley Burghardt, associate dean of undergraduate engineering, said as an administrator, he hopes students won’t stay silent about bad experiences in their classes. “I want to create an environment where if students are having bad experiences, I have a chance to learn about it and do something about it,” Burghardt said. Linzer agreed, saying feedback from students is key.